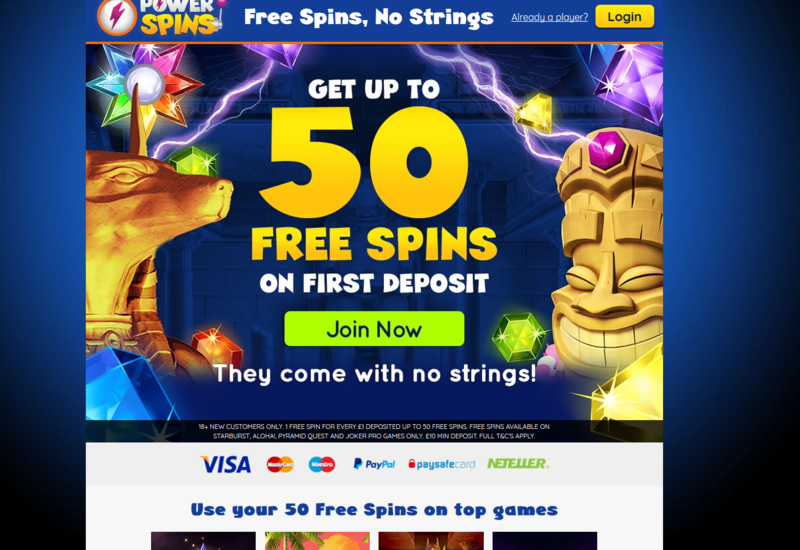 PowerSpins Casino: 50 FREE Spins Welcome Offer! 96% of new players recommend this casino 44 new players chose this casino today! 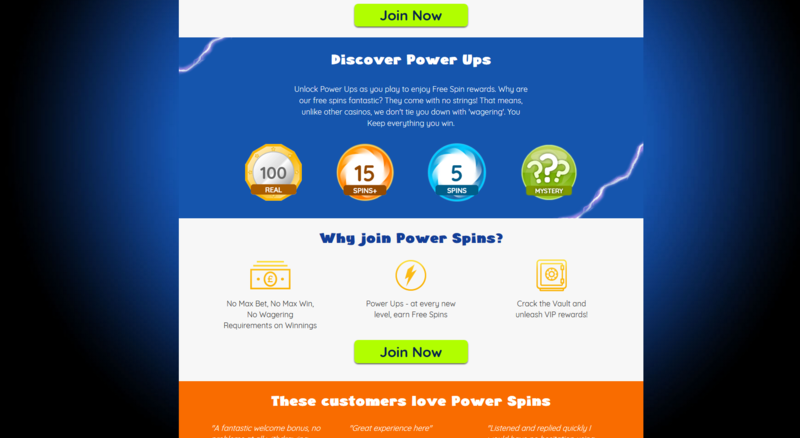 Do you want to find out what makes PowerSpins stand out from the crowd? Read about their exclusive bonuses, outstanding games and the loyalty program! I have some really amazing news for you - PowerSpins is one of those casinos that have outstanding bonuses! Whether you are a new players or a pro, there’s always something extra you can gain from PowerSpins. Whether it may be the generous welcome package, various loyalty offers or interesting challenges, this casino won’t let you down! Just take a look - PowerSpins has something that makes it different. Their new Welcome Offer is special - you get as many Free Spins as you deposit - £1 equals 1 FREE Spin! The offer goes up to 50 spins. For example, if you deposit £41, the casino rewards you with 41 bonus spins. The offer is valid only if you sign up through CasinoSmash and make your first deposit. Don’t hesitate - create a new player account and play! But what about the wagering requirements? There are none! This means that you can withdraw anything you win without any binding conditions. 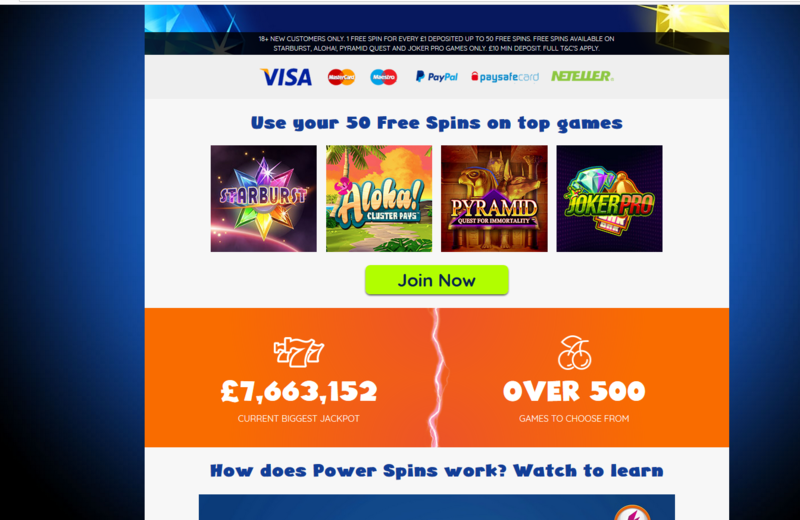 Power Spins Casino gives you a unique chance to win - unlike so many other online casinos! Minimum deposit is £10, minimum withdrawal is £20. Power Spins casino is generous not only to new players - it especially values long-term users. That’s why the more you play, the more benefits you get! On their PowerSpins account, every player has a Power Bar that indicates their current level. As you play, it gets charged - thus getting you to another level. Additionally, you receive a Power Up. Power Ups are really useful - they reward you with Free Spins. Even better - these Free Spins don’t have any wagering requirements. You get what you win! Mystery Power Ups - find out for yourself! When you reach the 50th level, you unlock the VIP status. PowerSpins’ Welcome Offer and Power Ups are not the only things to look forward to. There are also regular prize draws and leaderboard giveaways that depend on how much you spin. PowerSpins casino doesn't discriminate anyone - even those who don’t deposit much! You can win quite a lot of neat prizes like concert tickets, bonus cash, or Free Spins. Games are one of the most important - if not the most important part of any online casino. PowerSpins won’t leave you disappointed as they have a lot of games to choose from - there are more than 500 online casino games available! It is worth mentioning that PowerSpins casino is licensed by UK Gambling Commission & Alderney GCC, which guarantees quality and customer satisfaction. Additionally, the games are developed by famous software developers like NetEnt, IGT, Next Gen, Ingenuity, and Playtech. So, what are the best games of PowerSpins? Well, the biggest part of the games is filled with slot machines - there are more than 450 PowerSpins slots! A few of the most popular ones are Gonzo’s Quest, Age of Gods, Batman & Catwoman Cash, Aloha! Cluster Pays, and Dead or Alive. The games cater any taste, as there are both classic and modern ones. You can choose the game according to your taste - there are even slots based on movies like Kong. What else does PowerSpins have? Table Games, of course! Here you can play Blackjack, Baccarat, and other table games like a pro! Even though there is no possibility to download a PowerSpins app for your Android, iPhone, or tablet, there is some good news - the online platform is fully functional on said devices. In other words, PowerSpins works smoothly on mobile devices as the website is adapted to the size and capabilities of smart devices. You won’t have any problems playing at PowerSpins anywhere! The customer support at PowerSpins casino is really powerful! If any problems arise, you can contact the staff 24/7 via their Query Form. They will reply to you from 8.30 am until midnight all week long. Another option is calling them - the number is 0330 053 8000. You can call PowerSpins Customer Support from 9.30 am until midnight. There is the third option of writing an email to support@powerspins.com. All in all, PowerSpins is a decent online casino with great games and nice bonuses. Their 500+ games won’t leave you bored, and their bonuses will make you come back for more. It is extremely beneficial to become a long-term member as then you can receive some generous offers that will help you win. Also, remember that PowerSpins is one of the few casinos with no wagering requirements for their free spins! There are many deposit options on PowerSpins. You can choose the most convenient one for you. The Terms and Conditions are a legally binding agreement. By accessing the Websites, you agree to be bound by the Terms and Conditions and also by the rules for each of the products that we offer. If you do not agree to any of the provisions of the Terms and Conditions you should immediately stop using the Websites. These Terms and Conditions were last updated on 31 December 2018. 1.1 We are Bgo Entertainment Limited of Inchalla, Le Val, Alderney, GY9 3UL, a company registered in Alderney under registration number 1839 (“we” or “us” or “our”). 1.2 In these Terms and Conditions, “you” or “your” means you, the person who uses the Websites and/or the gambling services made available to you on or via the Websites (the “Services”). 1.3 If you have any questions, complaints or comments regarding the Websites or the Terms and Conditions then you can contact us by emailing support@bgo.com, support@powerspins.com or support@vegasluck.com. 2.1 We are licensed and regulated by the Gambling Commission of Great Britain under the provisions of the UK Gambling Act 2005 for the purposes of offering gambling services to customers in Great Britain (licence number 39533). You can find further details of our licence here. 2.2 The gambling services that we offer to customers outside Great Britain are regulated by our licence with the Alderney Gambling Control Commission (the “AGCC”) as issued under section 7 of the Alderney eGambling Ordinance 2009. The licence was granted to Bgo Entertainment Limited on 24 February 2012. 3.1.7 have not excluded from gambling; may not give you any notice, you w Terms and Conditions. If any change is unacceptable to you, you have not already had an account closed by us under paragraph 7.2 (Prohibited Activity) or paragraph 9.3 (Promotion Abuse), and not have self-excluded from gambling with us (see paragraph 10 ‘Responsible Gambling’). 3.1.9 at all times comply with these Terms and Conditions, and any other terms applicable to our provision of the Services to you (including the Playtech End User License Agreement which can be found in Appendix 1 to these General Terms). 3.2 We currently do not accept users from the following countries: the USA, US/GB Virgin Islands, US Minor Outlying Territories, North Korea, China, Syria, Yemen, Spain, Italy, France and Overseas Regions, Afghanistan, Libya, Sierra Leone, Iran, Iraq, Nigeria, Zimbabwe, Mali, Sudan, Belgium, Greece, Israel, Germany, Turkey, Switzerland, Hong Kong, Denmark, Estonia, Bulgaria, Cyprus, Macau, Philippines, Singapore, Hungary, United Arab Emirates, Romania, Portugal, Netherlands, Russia, Poland, Ukraine, Czech Republic, Guadeloupe, Martinique, Malaysia, Australia, Colombia and Sweden. 3.3 Even if we do accept your application for an account, depending on the territory in which you reside, you may not have access to the full range of services that we provide. 3.4 You are only eligible for one account on each of the Websites and your account is for your sole personal use only and shall not be used for any professional or commercial purpose, or by any third party. Your account must be registered in your own, correct, name and personal details and you must not duplicate your account through any name, person, family, household, address (postal or IP), email address, or device. 3.5.2 we may void all winnings and refund all deposits (less amounts in respect of void winnings) made in respect of that duplicate account and, to the extent that they are not recovered from us from the relevant duplicate account in question, any amounts that are due to be refunded to us by you in respect of a duplicate account may be recovered by us directly from any other of your accounts (including any other duplicate account). 3.6 Even if you meet the eligibility criteria set out above, we may choose to decline acceptance of your application for an account at any time and for any reason. 3.7 In order to register an account, you will need to provide certain personal details as well as creating a password. 3.8 You should ensure that you keep your personal details up to date as we may provide notification to you by email, telephone, text message or post. Furthermore, we recommend that you always log out every time you finish playing on our site. This applies to all devices including mobile phones and desktop computers. 3.9 You are responsible for maintaining the confidentiality of your username and password and are responsible for all activities that are carried out through your account. You agree to notify us immediately of any unauthorised use of your account of which you become aware. 3.10 Save for in respect of our negligence, we do not take any responsibility for any third-party access to your account and we will not be liable for any losses incurred by you as a result of misuse of your account by any person. Save for in respect of our negligence, all transactions where your username and password have been entered correctly by a third party will be regarded as valid. 3.11 If you are a parent or in charge of anyone that is not of the Minimum Age, you should undertake the necessary precautions to prevent such persons from accessing your account. Particular caution should be paid to mobile devices, especially if you leave your account logged in between sessions. 3.12 It is against the law to use the Websites or the Services if you are not the Minimum Age. 3.13 In order to verify your identity and that you are the Minimum Age when considering your application for an account, we may undertake any such verification checks as we may require, or as we may be required to undertake by third parties (including regulatory bodies). 3.14.2 proof of address (such as a utility bill, doctor’s note, solicitors letter or bank statement sent to your registered address). All such documentation must be no more than 3 months old at the time of verification and display your full name, registered address, the date of issue and the company/issuer’s header and/or logo. 3.15 We may freeze your account and prevent you from withdrawing funds until you have satisfactorily completed these checks. 3.16 We may need to reperform these verification checks from time to time for regulatory, business or security reasons. 3.17 If we have not been able to verify that you are the Minimum Age within 72 hours of you opening an account and depositing funds, your account will be frozen and no further gambling will be permitted until we verify that you are the Minimum Age. If we discover that you are not the Minimum Age, any deposits made by you will be returned to you, any winnings which you have accrued will be forfeited by you (and may be deducted from the amount of any deposit returned), and you shall return to us on demand any such funds which have been withdrawn from your account. 3.18 It is unlawful for you to deposit funds obtained from criminal, illegal or fraudulent activities into your account (or to attempt to do so). In addition to the identity and age verification checks set out above, we are required by law to undertake certain anti-money laundering checks to prevent such behaviour. 3.19 We monitor unusual or suspicious transactions and we may require that you provide additional identification documentation or proof of your source of wealth or source of funds at any time if you meet certain criteria, if we are concerned about your level of spend, or if we suspect you may be depositing funds obtained from criminal, illegal or fraudulent activities. Until you have satisfactorily passed such verification, we may freeze your account and restrict the withdrawal of any funds (including winnings and deposits). 3.20 Where we reasonably suspect criminal, illegal or fraudulent activities we may report such activity to the appropriate regulator or authority, close your account and retain all funds in your account (including deposits and winnings). 3.21 You can close your account at any time by giving us not less than 24 hours’ notice and contacting us at support@bgo.com, support@powerspins.com or support@vegasluck.com. 3.22 When you request closure of your account in line with paragraph 3.21 we will, subject to paragraph 3.23, return any outstanding balance in your account to you minus the withdrawal fee which applies (as outlined at paragraphs 4.17 and 4.18). When repaying any outstanding balance, we shall use the most recent method of payment on your account or any such payment method as we may reasonably select. 3.23 Upon closure at your request we shall (without limiting our rights under paragraphs 3.19 and 3.25) be entitled to withhold from any repayment of the outstanding balance of your account, any monies pursuant to paragraphs 7.2 and 9.3. 3.24 You may also choose to self-exclude your account, or to temporarily suspend your account using our ‘time-out’ function. Self-exclusion and suspension are effective immediately. Details of both tools are further set out in the responsible gambling section of the Websites. 3.25 In addition to our other rights in these Terms and Conditions to close your account for specific reasons, we may also close your account at any time for any reason on written notice. If we do so, subject to paragraph 3.27, we will issue you with all real money funds left in your account at the time of closure. 3.26 Where we elect to close your account, other than in circumstances where paragraphs 3.24 and 3.27 apply, if you have qualified for or received any active bonus, we will permit you to receive your bonus or use the remainder of your bonus and complete any wagering requirements associated with the bonus. In the event that this paragraph applies, we shall refund the balance of your account as soon as is reasonably practicable following your use of any bonus or at your request. 3.27 Where we close your account pursuant to paragraph 7.2 (Prohibited Activity), or paragraph 9.3 (Promotion Abuse), the balance of your account will be non-refundable and deemed to be forfeited by you to the extent of any claim that we may have against you as at the date of any such closure (whether under your account, a duplicate account or otherwise). 3.28.3 we shall address the issue that has given rise to the suspension and attempt to resolve it as soon as reasonable practicable so that the account can either be reactivated or closed. 4.1 You may add funds to your account by a variety of payment methods, including (but not limited to) Visa, Mastercard, PayPal, Maestro, Skrill and Neteller. Methods available can vary dependent on where you are located and this will be reflected in the options presented to you in our intuitive cashier. You can only use a payment method registered in your name to deposit funds. If you deposit using a payment method in respect of which you are not the account holder, we reserve the right to treat any deposit as being invalid and any winnings arising from such deposit as void, pending the satisfactory completion of all relevant checks. 4.2 You may select more than one method of payment. When you add a new payment method, you must make a deposit via that payment method, before any withdrawal can be processed to that payment method. 4.3 The minimum amount which you can deposit in your account in a single transaction is £10 (or an equivalent in your chosen currency). You can set a deposit limit on your account at any time by visiting the ‘Responsible Gaming’ section of the Websites. Any deposit limit that you set cannot be increased without giving us 24 hours’ notice of your wish to increase your deposit limit and only when you re-request the increase after 24 hours have elapsed will the increase apply. 4.4 We are not responsible for any charges or fees applied by your card issuer, bank or financial institution as a result of your making a deposit into your account. 4.5 For every deposit that you make in to your account under £500, we will charge a tax-offset fee of 2.5% of the amount deposited (subject to a minimum of 50p (or an equivalent in your chosen currency)). This means that if you deposit £100, we will charge £102.50 on your payment method and £100 will be credited to your account or if you deposit £10 we will charge £10.50 on your payment method and £10 will be credited to your account. 4.6 No interest shall be payable to you on any funds held in your account. For the avoidance of doubt, you shall not use your account for any purpose other than in order to use the Websites and Services (for example as a bank account) and should we become aware of deposits and withdrawals without commensurate gaming activity, we reserve the right to deduct an administration charge. 4.7 We do not offer a credit service. 4.8 Your funds are held in a separate bank account from our business accounts. The account is named ‘Client Account’ to distinguish it from the other business accounts that we hold. Under the British Gambling Commission’s customer funds rating system, this meets the requirements for the segregation of customer funds at the level: basic. Accordingly, funds are deemed to be unprotected in the event of insolvency. As such we comply with both the requirements of the Gambling Commission of Great Britain and the Alderney Gambling Control Commission. 4.9 Our parent undertaking BGO Limited, Suite 5 Valley Towers, Valley Road, Birkirkara, Malta, BKR9022 has guaranteed its intentions to provide financial support to enable us to meet our liabilities in the event of insolvency, including player funds. Should we cease to operate, all reasonable endeavors to pay monies back to you will be made by our parent. In the event that the parent is unable to contact you, you will have a period of no longer than 120 days from the date on which we ceased to operate to contact the parent and reclaim funds owed. These funds may not be refunded after the 120 day period has passed. 4.10 To the extent that you are required to do so by your local law, tax, or other authorities, you are responsible for reporting your winnings and losses arising from your use of the Websites. 4.11 You are responsible for providing us with the correct bank account information for the withdrawal of your funds. We will not repay any funds paid to the incorrect account if this was due to your error. 4.12 You may select a preferred withdrawal method provided you have already deposited with that method. Where multiple payment methods have been used on a single account, we may allocate the withdrawal to the payment method of our choice. We may process withdrawals for over £10,000 by wire transfer. 4.13 When you request a withdrawal, you will have a maximum period of 24 hours to reverse the withdrawal, depending on your level of play. The availability of a reversal will be made clear to you on the Websites. If you make a reversal request within this time, the funds will not be withdrawn and will revert back to your account. 4.14 You must not make or attempt to make any chargebacks, and/or deny or reverse any payment that you have made and you agree to reimburse us for any chargebacks, denial or reversal of payments you make and any resulting loss suffered by us. 4.15.3 that you have not made or attempted to make any chargebacks, denials, cancellations or reversals of payments. 4.16 We are not responsible for any charges or fees applied by your card issuer, bank or financial institution as a result of you requesting a withdrawal. 4.17 We charge a fee of £2.50 (or an equivalent in your chosen currency) for all withdrawals of funds. This means that, if you request a withdrawal of £100, your bank account will be credited with £97.50. 4.18 Where you request an international bank transfer, we may also charge an additional fee of £15 (or an equivalent in your chosen currency). 5.1 You may only place a bet or a wager up to the value of cleared funds that you have in your account. We reserve the right to void any bet or wager which we may have accepted by mistake when your account did not have sufficient funds. 5.2 We may also declare any wager as void if we have grounds to suspect you have undertaken any Prohibited Activity, in which event no winnings will be paid to you. 5.3 The minimum and maximum wager size varies from game to game to game on the Websites and is displayed on screen. Please see the individual game for more information. 5.4 Once you have confirmed the details of your wager and started the game, usually by undertaking an action such as ‘spin’, ‘bet’, or ‘play’ your wager will be deemed to be accepted and you will be unable to change or vary it. 5.5 Winnings due to you will be credited to your account balance. This is not proof of win and subject to your rights under paragraphs 12 and 16 (as applicable) of these Terms and Conditions you agree that our records (or any records of our third-party game providers) shall be the final authority in determining any winnings. 5.6 All slots, video poker, table, card and arcade games featured on the Websites (except for progressive jackpots) are restricted to a maximum payout of £250,000 (or the equivalent in your chosen currency) to any one customer on any single wagering round. In the majority of instances this is by means of stake limits imposed within the applicable games. For the avoidance of doubt this is regardless of the size of the stake or the number of bets placed. Should you win in excess of this amount in any one betting round as a result of errors in the stake limits, you will win £250,000 (or an equivalent in your chosen currency) and any amount above this shall be void. 5.7 We make every effort to ensure that errors or mistakes do not occur in any game or with any transaction relating to your account. Save for as a result of our negligence, we may void all winnings or cash-ins enabled by wins resulting from any error or mistake or any technical fault (including, but not limited to, incorrect game payouts or game malfunctions) with any of the games or Services offered. You agree to forfeit any winnings that result from such errors, mistakes or technical faults and acknowledge that in some instances withdrawal requests may be held for approval to ensure that such errors, mistakes or technical faults have not occurred. 5.8 No maximum payouts apply to progressive jackpot winnings. Subject to paragraphs 5.7 above and 5.9 below, should you win a progressive jackpot you will receive the amount that is displayed within the progressive game that you are playing at the time of your win. 5.9 All progressive jackpot wins are subject to verification and validation by the game supplier. Progressive jackpot win amounts may fluctuate as a result of verification and validation and you agree and understand that the verified progressive jackpot amount in the formal notification received from the game supplier shall determine the exact amount of any progressive jackpot win due. 5.10 If you win a progressive jackpot we will endeavour to pay the full amount won to you within 31 days of the win, pending verification of the jackpot amount by any game supplier and subject to paragraph 4.15 above. We reserve the right to pay progressive jackpot wins in the currency in which it is paid to us by the game supplier. 5.11 We may decommission a progressive jackpot at any time for any reason. 5.12 You are solely responsible for recording, paying and accounting to any relevant authority for any tax or other charge that may be payable on any winnings you receive. 6.1 If you have not logged into your account or otherwise not accessed or used it for a continuous period of 12 months, or if your account has been frozen pending verification as outlined in paragraph 3.19 for a continuous period of 12 months, your account shall be deemed to be inactive. If your account becomes inactive we will continue to use all reasonable endeavours either to satisfactorily complete verification or use all reasonable endeavours to contact you to determine your wishes in respect of any unutilised real money funds. 6.2 If your account remains inactive for a further period of 12 months, or if it is still frozen, it shall be deemed to be dormant. If your account is deemed to be dormant, we will use all reasonable endeavours either to remind you to satisfactorily complete verification or to contact you to determine your wishes in respect of any unutilised real money funds. If, after a further 6 months, we have still not been able to contact you to determine your wishes, your account will be closed. 6.3 If you contact us after the 30-month period and subsequent account closure seeking a refund of your account balance we shall process such refund, subject to paragraphs 7.2 and 9.3, subject to you satisfactorily completing verification in line with paragraph 3.19 if required and subject to our legal and regulatory obligations. 7.1.9 breach any of these Terms and Conditions in any other way. 7.2 The activities in paragraph 7.1 are each a form of “Prohibited Activity”. We may suspend, restrict or close your account at any time without notice if we have reasonable grounds to believe you have undertaken any Prohibited Activity and/or recover from your account the amount of any deposits, pay-outs, bonuses or winnings which have been affected by or are in any way attributable to the Prohibited Activity. The rights set out in this paragraph do not affect any other rights (including any common law rights) that we may have against you under these Terms and Conditions or otherwise. 7.3 In exercising our rights under paragraph 7.2 we shall use all reasonable endeavours to ensure that we exercise such rights in a manner which is fair to you. 7.4.2 “Criminal Activity” shall include, without limitation, money laundering and any offence under the Gambling Act 2005. 8.1 From time to time we may offer promotions for rewards such as free spins and bonuses or loyalty schemes (“Rewards”). 8.2 All promotions, Rewards and loyalty schemes are subject to the terms set out in this paragraph 8 as well as any other specific terms relating to the relevant promotion, Reward or loyalty scheme that we publish on the Websites, in particular on the ‘Promotions’ page (“Promotion Terms”). In the event of any conflict between the Promotion Terms and the terms set out in this paragraph 8, the Promotion Terms will apply. 8.3 Other than the entry into loyalty schemes, a promotion (and the Rewards derived from this) cannot be used in conjunction, or combined, with any other promotion/Reward. 8.4 You will automatically be entered into our Casino and Bingo loyalty schemes when you play with real-money on the Website. 8.5 Where a promotion or loyalty scheme requires that you make a deposit in order to receive a Reward, a reversed withdrawal made in accordance with paragraph 4.13 will not count as a deposit for these purposes. 8.6 If a technical misconfiguration results in an incorrect Reward being added to your account, we may correct this error by removing any winnings received and re-adding the Reward with the correct configuration. 8.7 If your account is closed either at your request or in circumstances where paragraphs 7.2 or 9.3 apply all Rewards will be cancelled. 8.8 We may cancel or withdraw a promotion or loyalty scheme at any time at our reasonable discretion. Any such cancellation will not affect any Reward already awarded to you or redeemed by you. 9.1.5 use a VPN or masking your IP address in order to enter a promotion or obtain a Reward that you would not otherwise be eligible for. 9.2.4 use of multiple accounts (whether with ourselves or others, held by you and/or acting in concert with others) to cover all or a majority if eventualities. 9.3 The activities in paragraph 9.1 are each a form of “Promotion Abuse”. We may suspend, restrict or close your account, revoke any Rewards granted to you, and require repayment of any winnings that you have been granted by way of Promotion Abuse (including by deducting amounts held in your account) immediately and without notice if we reasonably consider you to have undertaken Promotion Abuse. 10.1 We take responsible gambling very seriously. We provide the ability for you to self-exclude from your account with us, take time out from the use of your account, and set specific controls to limit the funds or time you spend gambling. For more information on the responsible gambling tools that we provide, or if you have any concerns in relation to your gambling, please go to the ‘Responsible Gaming’ section of the Websites or contact our Customer Service and Responsible Gaming Team. 10.2 We will use all reasonable endeavours to ensure compliance with self-exclusion. We will implement reasonable checks and safeguards to ensure that whilst you are self-excluded you are not sent marketing material about gambling from us and that you cannot access the Services. However, self-exclusion requires the joint commitment of both you and us. During the self-exclusion period you must not attempt to try to open new or duplicate accounts and you accept that we have no responsibility or liability whatsoever if you continue gambling and/or seek to use the Websites and we fail to recognise or determine that you have self-excluded in circumstances that are beyond our reasonable control, particularly if you have changed any of the registration details previously submitted (including if you open another account with substantially the same information, albeit inputted into the registration form in a different way). 10.3 If we suspect that you have a gambling problem, we may freeze your account whilst we are undertaking additional checks to establish whether you are comfortable with your level of spending. Following these checks, if we find that you are not in control of your gambling, we may close your account and issue you with all real money funds left in your account at the time of closure. 10.4 The National Association for Gambling Care Educational Resources and Training (“GAMCARE”) (www.gamcare.org.uk) provides information, advice and counselling to individuals, their family and friends who have concerns about problem gambling. The free helpline number for GAMCARE (available 8am – midnight, 7 days a week) is 0808 8020 133). 11.1 We provide customer support services for all of our players. Our Customer Service and Responsible Gaming Team can be contacted by email, telephone and live chat support. Our hours of operation and our contact details can be found on the Help page. 11.2 When you contact our Customer Service and Responsible Gaming Team they will perform an identity check to ensure that you are the account holder. 11.3 Please note that all interactions with our Customer Service and Responsible Gaming Team and VIP teams (including phone calls) may be recorded for training, monitoring and quality assurance purposes. 12.1 We hope that you are completely satisfied with the Websites and the Services. However, if you have a complaint, this section explains how to make such a complaint and the process we will apply once you have done so. 12.2 You can raise a complaint with us at any time by contacting our Customer Service and Responsible Gaming Team by emailing support@bgo.com, support@powerspins.com or support@vegasluck.com or visiting the Help page. Please provide your username, full name, as much detail as you can about the complaint, and if necessary include any relevant attachments. 12.3 Any complaints must be registered with our Customer Service and Responsible Gaming Team within 6 months of the occurrence of the event to which the complaint relates. We will not be able to deal with any complaint in respect of an event which pre-dates this time period. 12.4 We will acknowledge the receipt of the majority of complaints within 24 hours. In some rare instances our acknowledgment may be delayed (for example if the substance of the communication or facts about the complaint are unclear). 12.5 In some instances, your complaint will be straightforward (for example a misunderstanding or an acknowledged system error). These complaints can be resolved quickly by our Customer Services and Responsible Gaming Team and without prolonged consideration in line with our full complaints process. Where this is the case, we reserve the right to do so. 12.6 All other complaints will proceed to our Stage 1 consideration whereupon a member of our Customer Service and Responsible Gaming Team Management will be tasked with investigating and responding to your complaint. At the conclusion of such investigation (normally within 5 working days) we will communicate to you our decision in relation to the complaint. 12.7 If you are dissatisfied with our decision and response to your complaint at this stage, then if we have not informed you that such a decision is our final determination, you can ask that your complaint proceed to our Stage 2 consideration. It would be helpful to us at this stage if you could outline why you remain dissatisfied with the Stage 1 decision. 12.8 Stage 2 complaints will be investigated by Senior Management. The information considered at Stage 1 will be reviewed alongside the decision and any further information that has been provided. At the conclusion of such investigation we will communicate to you our decision in relation to the complaint and outline what options are available to you should you remain dissatisfied with the outcome. 12.9 We aim to resolve all complaints as soon as possible and will use all reasonable endeavours to conclude our complaints process within 8 weeks of our initial acknowledgement. We will extend this 8-week period should you fail to engage with the complaints process in a timely manner, taking into account any delay caused by such a failure. If it appears that it will take us longer than 8 weeks we will write to you to advise you of the revised timescale. 12.10 We reserve the right to issue a final determination in relation to any complaint at any stage in this process, particularly if we consider your complaint to be without basis, frivolous, vexatious or easily resolved. Should we do so, we will make this clear to you and you will have the choice to accept the decision or proceed to ADR (if applicable – see paragraph 12.11). 12.11 If you disagree with our final determination, the complaint relates to the gambling services we provide, and you are resident in Great Britain, you have the right to seek resolution of your complaint via an alternative dispute resolution ("ADR") procedure. We have appointed eCOGRA as our service provider of ADR services. Where the value of the dispute is less than £10,000 we will honour the findings of any ADR procedure absent material or manifest error on the part of the ADR provider. You can contact eCOGRA via their website which can be found here. 12.12 Please note that complaints that do not relate to the gambling services we provide (for example poor customer service, types of product on offer) are not appropriate for referral to our ADR provider and will be dealt with internally. 12.13 If you disagree with the decision of our Senior Management Team, and are resident in a country other than Great Britain, you should contact the AGCC via their website which can be found here. We will abide by any decision made by the AGCC and assist them with any investigation that they undertake. Please note that the AGCC will not, however, deal with any disputes that relate to games provided by SG Digital. 12.14 You also have the right to submit your complaint to the European Online Dispute Resolution (ODR) platform that is available here. However, please be aware that this may increase the amount of time it takes to resolve your complaint. 12.15 We expect that all facts and content of complaints remain confidential between us during the complaints process and any ADR procedure. This does not apply where you wish to seek confidential advice or where law or legal process requires public disclosure. Nothing in this process is intended to affect your legal or statutory rights in this regard. 13.2 We will co-operate with any law enforcement authorities or regulators or court orders requesting or directing us to disclose the identity of or locate anyone for the prevention or detection of crime or the apprehension or prosecution of offenders. There may be other circumstances in which we may be required by law to disclose information about you or your use of the Websites or Services. 14.1 The Websites and all content and software made available on it (including, but not limited to, the games) is owned by, or licensed to, us. "bgo", “bgo.com”, “powerspins” and “powerspins.com”, “bgo Live”, “bgo Bingo”, “Candy Club”, "vegasluck" and "vegasluck.com" are trademarks, service marks, and trade names owned by us. 14.2 Your use of the Websites and its contents grants no rights to you in relation to our intellectual property rights including, without limitation, trademarks, logos, graphics, photographs, animations, videos and text or the intellectual property of third parties in the Websites and its contents (including but not limited to any of the games). 14.3 You may not copy, reproduce, republish, download, post, broadcast, record, transmit, commercially exploit, edit, communicate to the public or distribute in any way the Services, web pages or materials on the Websites or the computer codes of elements comprising the Websites other than for your own personal use. 14.4 We may make available software which may be downloaded and installed on your PC, mobile and/or any other device. Subject to these Terms and Conditions, we hereby grant to you a revocable, non-exclusive, non-sublicensable, non-transferable licence for the use of this software on PC, mobile and/or any other device owned or operated by you, solely for the purpose of using your account and our Services. 14.5 Any use other than that permitted under these terms may only be undertaken with our prior express authorisation. 15.1 We may provide links to other websites from time to time (via advertising or otherwise). These links are provided for your ease of reference and convenience only. We do not control such third-party websites and are not responsible for their contents. Our inclusion of links does not imply any endorsement of the material contained in such websites or any association with their operators. 15.2 You acknowledge that we will not be party to any transaction or contract with a third party that you may enter into and we shall not be liable to you in respect of any loss or damage which you may suffer by using those websites. You agree that you will not involve us in any dispute between you and the third party. 16.1.2 limit your statutory rights (statutory rights include, for example, that we will provide the Services with reasonable skill and care and within a reasonable time). For more information about your statutory rights visit www.citizensadvice.org.uk. 16.2 You have certain legal remedies if we breach any of your rights which may apply irrespective these Terms and Conditions. Nothing in the Terms and Conditions is intended to affect these legal rights or other rights to which you may also be entitled. 16.3.3 in respect of any other liability, five thousand pounds sterling (£5,000). 16.4.6 failure to provide the Services or to meet any of our obligations under these terms where such failure is due to events beyond our control. “Events beyond our control” means any cause beyond our reasonable control which prevents us from providing the Services or fulfilling any of our other obligations under these terms and includes but is not limited to fire, flood, storm, riot, civil disturbance, war, nuclear accident, terrorist activity and acts of God. 16.5 Whilst we make reasonable efforts to correct any errors, defects, omissions or malfunctions in the Websites and Services as soon as practicable once they have been brought to our attention, we do not promise that the Websites and/or Services will be free from errors, defects, omissions or malfunctions. 16.6 We do not promise that the Websites or Services will be available uninterrupted and in a fully operating condition. Access to the Websites or Services may be suspended temporarily and without notice in the case of system failure, maintenance or repair or for reasons reasonably beyond our control. 16.7 The Websites and Services are provided on an ‘as is’ and ‘as available’ basis. Other than as described in this paragraph 16, we do not make any representation or make any contractual promises in any way in respect of the Services or Websites, including, without limitation, any advice given (on a personal or general basis). 17.1 We are constantly looking for new ways to improve the Websites and our Services. We therefore may amend these Terms and Conditions from time to time for a number of reasons, including (without limitation) for commercial reasons, to comply with law or regulations, or to comply with recommendations, guidance or instructions from a regulatory body. 17.2 Where we make substantial changes to these Terms and Conditions, we will notify you of such changes by one of the methods set out in paragraph 17.3. 17.3.2 email (to the email address you have previously supplied us with). 17.4 For minor or insubstantial changes, we may not give you any notice, you should therefore ensure that you regularly check the Websites to confirm the date on which the terms were last updated. 18.1 If any provision of the terms of these Terms and Conditions is found by a court or a regulator to be invalid or unenforceable the other provisions shall continue to apply. 18.2 If you breach these Terms and Conditions and we take no action against you, we will still be entitled to use our rights and remedies in any other situation where you breach the Terms and Conditions. 18.3 We may wish to transfer our rights or obligations, or to sub-contract our obligations under these Terms and Conditions to another legal entity. You agree that we may do so provided that this does not adversely affect the standard of service you receive under these Terms and Conditions. 18.4 You may not transfer any of your rights or obligations nor sub-contract any of your obligations under these Term and Conditions in whole or in part. 18.5 Nothing in these Terms and Conditions shall be construed as creating any agency, partnership, or any other form of joint venture between you and us. 18.6 These Terms and Conditions are not intended to give rights to anyone except you and us. This does not affect our right to transfer under paragraph 18.3. 18.7 If you are resident in the United Kingdom, these Terms and Conditions and the relationship between you and us shall be governed by, and interpreted in accordance with, the laws of the England and Wales. The courts of England and Wales shall have non-exclusive jurisdiction, which means that you may bring a claim in England and Wales or in the EU country in which you live. 18.8 If you are resident in any jurisdiction other than the United Kingdom, these Terms and Conditions and the relationship between you and us shall be governed by, and interpreted in accordance with, the laws of Alderney. The courts of Alderney shall have non-exclusive jurisdiction, which means that you may bring a claim in Alderney or in the EU country in which you live.